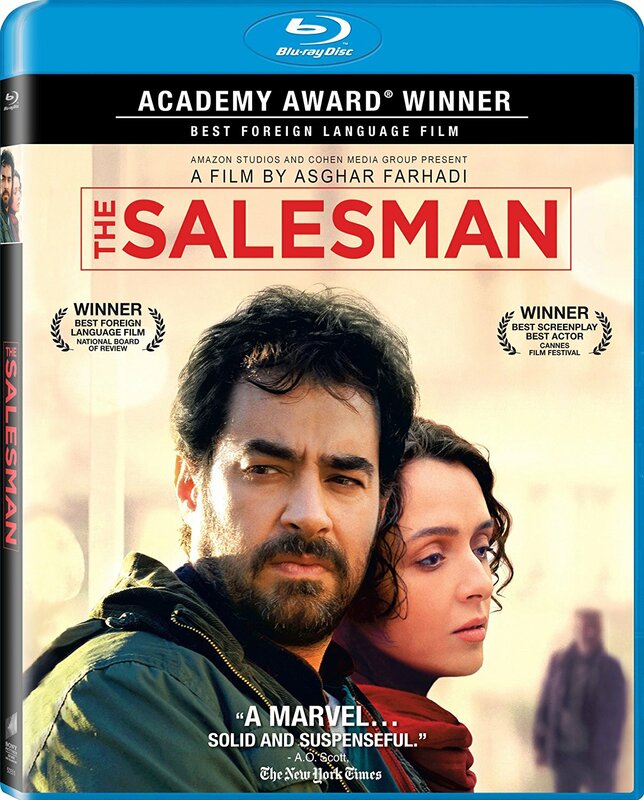 There are numerous ways to approach thinking about The Salesman, a deceptively simple film from Iranian filmmaker Asghar Farhadi and the winner of Best Foreign film at this year’s Academy Awards. Although resembling a basic revenge narrative, it is also a film that is distinctly Iranian. At the same time, the film comments on the differences between East and West in the depiction of an Iranian stage adaptation of Arthur Miller’s “Death of a Salesman.” But the beauty of Farhadi’s work is not simply that it is a revenge narrative, nor that it has commentary on cultural differences, but in the way that it accomplishes both of these tasks with subtlety and ambiguity. Even as I continue to think about the end, I am constantly faced with shifting certainty about the events in the film and their meaning. As with many of Farhadi’s films, the story centers on the relationship and home life of a couple clearly representing a larger group in Iranian society. Emad (Shahab Hosseini) and Rana (Taraneh Alidoosti) are a young married couple who are both artists, coincidentally also acting as spouses in a stage adaptation of Miller’s play. Whether we are meant to compare the relationship between the stage couple and the actors is unclear, especially when comparison between the fictional characters and an elderly couple also becomes available in the final act of the film. This is one of many allegorical connections developed in this richly layered film. Another of them occurs almost immediately after the film begins, when the apartment building Emad and Rana live in begins to crumble due to nearby construction, also serving a practical function to move the narrative forward. Forced to find a new place to live, Emad and Rana move into the former home of a young woman who happens to have a questionable reputation. Burdened with the former tenant’s belongings, the couple does their best to make the new apartment home, until an unexpected visit throws their life into turmoil. One evening after working on their play, Rana is alone in the apartment when an acquaintance of the former tenant arrives. Thinking it is her husband arriving home from a meeting about the censorship of their play, Rana buzzes the man into the building and opens the door of the apartment. We do not see the events that follow, leaving a great deal of ambiguity for the remainder of the film. Even Emad is left in the dark about the precise details, though the fact that the neighbors find Rana naked and injured in the bathroom is enough for him to come to certain conclusions. Rana’s behavior following the incident is further evidence, causing Emad to become obsessive in his search for answers. While Rana begins to withdraw into herself, refusing to be alone in the apartment and no longer able to endure the male gazes during her performances, Emad seeks some sort of retribution for the way his wife was wronged. The narrative builds like a mystery, continuing long after we have discovered the culprit. Even when we know who entered their apartment, there remains the question of what exactly happened in the bathroom, and perhaps more importantly, what Emad will do with this information. More of a cultural meditation on revenge than a revenge film itself, The Salesman leads to a final act showdown with suspense not reliant on violence or action but upon the response and reaction to information by the characters involved. Upon first viewing, it would seem that there are too many questions left unanswered. There is too much unknown by the audience in the events themselves, but this is where Farhadi’s masterful filmmaking leaves the audience with clues for consideration. We may not know exactly what happened in-between the scenes we are allowed to witness, but there are numerous allegories throughout the film that offer ways to interpret the clues. In other words, even without knowing what happened to Rana, we are affected by the commentary on societal response to the events. The manner in which even incidental supporting characters act can offer possible meaning for the film as a whole, just as the crumbling of Rana and Emad’s former home seems to have significant implications. And these are just the minor comparisons which can be made, while many larger ones are at the forefront, including the title being drawn from the play being performed by our two protagonists. What the connection is between fictional material and the events in the narrative must be decided individually by each viewer, just as the truth about Rana’s attack and the subsequent state of the couple’s relationship is left to interpretation. Farhadi is a filmmaker of great talent, not only for his abilities as a storyteller but for his willingness to allow the audience to participate in an understanding of the complex material. The Blu-ray release includes a featurette that has an interview with Farhadi, which is insightful without spelling out the entire meaning of the film for viewers. There are no alternative ways of viewing the film, and though Farhadi’s filmmaking is growing increasingly cinematic, there is little need for a high definition presentation of a film as subdued as The Salesman.